Hmmm, sounds like some stuff is frozen. I assume your log is getting skipping ticks messages every 60 seconds or so too? It sounds like something slowed down the system so the timing stopped--might be bad entity. Why don't you try stopping and restarting your server in peaceful for a few minutes. Load the same areas you were in when teh problem happened. Then turn back on the difficulty. that will help if the issue was an entity bug as it'll force them to despawn. Let me know if that was the issue and this fix works. awesome! Glad it worked! I like running the map with friends too, let me know how it goes! Fireflies drop it as a very rare drop, leopard riders are holding one and can drop it at the same chance as dropping gear, Blazes can drop it as an uncommon drop but the chance is more then double the previous 2...they are probably your best bet. Blazes can spawn in dark in summer. The creature that has the highest drop chance is the winter Ghasts though they are hard to kill. They drop it 1/4 of the time I think. Fire crystals are also a reward for killing several lair monster bosses and I think in 1 or 2 exclusive ruin locations. Also, about the game-start and spring rain showers. I put a clear in for a while the first year so it stayed sunny while players went through the intro and got oriented as that took some people a long time. It was too long though. I've reduced it to 1 day now in the new version from login so you should get spring rain patterns a bit sooner now. Thanks for the feedback, any other suggestions or bugs you noticed? As for suggestions, maybe make a net launcher or something to capture mobs. Because creature capture capsule's a bit innacurate. Speaking of which, are multi-stack entities such as the treemanator supposed to fall apart and die in water? Treemanoids falling apart in water is currently a bug and it's getting fixed in the update I'm working on today. Nice find on the aura! If you started with 3.5 hearts you are experiencing a well-known bug with forge mods. In a proper game you start with 0 armor and have to craft it through upgrades. For some reason the forge modded clients will not recognize the new armor attribute system that was introduced way back in minecraft 1.9. They still don't support it and upgrades won't work as forge overwrites the armor with the default leather armor value of 3.5. :/ Kind of lame, I'm hoping they fix it soon. If you guys know where I can submit a bug report to forge to let them know that'd be great. So your upgrade actually worked and now you went from 0-->1 armor but you can't see it since you are running a forge client is my guess. Lezandria wrote a detailed description of the issue in the "recommended settings" section of the OP I have instructions there on how to install optifine and play on the vanilla client if you want to use a seperate profile on this map. As soon as you log in without forge you should see the upgrade worked and you are on 1 armor now (from 0). Stay tuned for the first big update to the map today and the instructions I'll post up on how to install it without restarting your game! We also did some recording for the trailer. I'll need a few more hours to get through my list of changes but the majority of the work is done. We added a huge new asteroid biome to visit now further out in the void once you get your glider and jetpack upgrades! It wasn't just treemanoids falling apart; slime queens did too. right now due to the way they work I force them to despawn if the player walks away to keep numbers down. This is because the mob will leave tree trunks behind if I let it despawn naturally. This was going to be fixed this update so that name-tags could keep all my custom creatures around including treemanoids but due to a minecraft bug where using a name tag doesn't increment the stat scores I can't do it the way I'd hoped. If you want this feature please upvote this concern here on the official minecraft bug tracker as they are ignoring the issue at the moment. If it is not fixed soon I may add a custom item for players to use to keep custom mobs around so don't worry. Keeping treemanoids and other custom creatures is on the "planned future changes" list! Please keep reporting your suggestions. I'm releasing updates every 2 weeks adding content and improving things as this map is still a brand new public Beta release and I've got a lot more content planned. The update is done! The first official Beta update! We also recorded a ton of footage that I'll turn into a trailer this coming week. Stay tuned! there are 2 region files, one to update the mechanics and one to add the new biomes and asteroids. Have fun exploring the new areas! The builders worked very hard on this area, it is a beautiful custom mesa asteroid chain complete with unique underground and giant trees, etc. You may find some WIP areas nearby like a stone asteroid chain that will be further developed in future versions. As usual to install simply unzip the update file and drag the two region files you find there into the region folder of your space expedition save. Overwrite the previous 2 files. Your map will be updated and you'll get a nice changelog and message when you next log in! This is the first "official" update and you do not need to have installed the midweek patch V1.0.2. You can just jump straight to this one. Also, my official update system is fully implemented now. You can also find all future updates by using the "Check for Space Expedition Updates" sign in the holodeck and following the link. You will want to install them in order to ensure full compatibility. - added: a new custom asteroid biome to visit further out in the void near the starting asteroid cluster! - optimization: the first winter has smoother daylight cycling and no sudden daylight skip when the first sundown happens. Instead the first day passes normally and the sun just doesn’t come up again till spring giving a smoother transition to the twilit days and one additional day to prepare. - NEW CHALLENGES have been added in the form of a challenge book! The list was crafted by danaphanous and SnapshotDesign and can be found in the small, middle creature info file chest of the holodeck if you want to go check it out! In new games it is found in one of the ship chests. PS: Oh and WanderingSoulOfTime, the first episode of your LP is now on the main post! How do I get shell scales other than rarely from turtles? Im SnapshotDesign, the co-creator of the challenge list of this amazing map. Just thought I should introduce myself. Thanks to dan and everyone else for all their help! Hey Gavin, I think curse launcher works with this map if you wanna go that route. At least the armor bug has only every been reported with Forge clients. Sorry about your minimap Lezandria runs the game with some support mods I think so she may be able to help you there. She's the one that originally discovered the issue. Thanks for the report! Turtles do not always suffocate, just some of the time when they spawn and I'm aware of the issue, I'm curious how you noticed that though? Turtles can only spawn in conditions 16 or more blocks away from the player along with most of the custom spawns. Fireflies lose their fire trails in rain or after passing through water yes. It is a "known" issue and it happens because those are actual flames from being on fire (which water puts out). but I'm curious why you mention rain in particular. It doesn't rain in the summer so usually players won't see the flame bodies disappear. Did it for you? Or was this after the transition to Fall and the first fall thunderstorm? I could add a command to periodically check for and have fireflies re-ignite themselves if it was bothering you but I hadn't bothered yet because some players seemed to like the effect. I'm undecided atm. I'd love your thoughts. Dragon bones are non-renewable atm and can only be found in ruins. There are several other sources of shell scale but in the summer turtles are the only one. You will find other mobs can drop it in fall/winter too though. 16 blocks isn't very far after I've gotten 1st year buff and am sprinting back and forth along the river trying to farm the turtles for scales, so I've run into several where I have to break the blocks they're in to kill them. I noticed the suffocation when I got to one and it died as I was digging it out. I noticed the fireflies go out because the instant it turned to fall it started a thunderstorm. I don't know about anyone else, but since they're actually fiery like blazes, I think they should just die in the rain. Can I get a hint as to where the big library shown in the screenshot on the main post is? It's the only one of those places I haven't found yet. What's the point of armor and protection enchants for loot if we can't use them? I'm also not sure I want fireflies to die when they stop burning... I've been hunting too many of them near water and had them go out just before I finally managed to hit them. I probably would've been really annoyed if I had gotten that close to killing them just for them to die without leaving behind any drops I'll gladly exchange that tiny bit of realism for more consistent and less annoying gameplay. 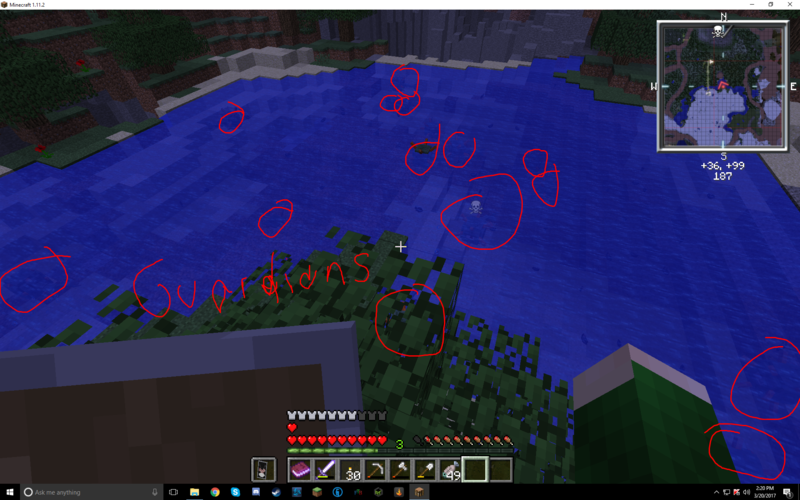 Now, if all of your squid are spawning in a relatively small area (for example if there's only one tiny pond within spawn range), those guardians will be very crowded, but in areas with more water, they'll for the most part be a bit more spread out and their high numbers won't be nearly as obvious. And I think those areas are the reason why the cap is so high, because the waters will look quite empty with like just 10 guardians spread out everywhere And a bit of challenge has never killed anyone! ... No, I take that back, it killed me plenty of times, but that's half the fun! I'm assuming you haven't found enough of any of the metal shards to craft them into ingots yet? The ingots unlock special recipes that may answer your question about the armor and enchants. I definitely suggest keeping all enchanted gear and especially the metal armor you find until you get those custom modules, there will be uses for them later! It is on the main asteroid, but can be a bit tricky to find since it is pretty deep underground. The easiest way to find it is to fly around the edge of the asteroid and keep an eye out for obvious watery caves. If you don't have the elytra yet, you'll probably have to dig around for a bit until you find it. How do I use the disenchanter? I've made it but can't figure it out and there's no instructions.